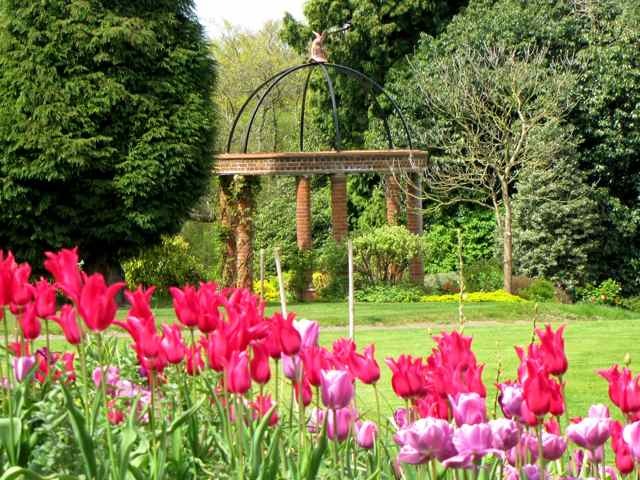 A real 5* garden and rarely publicised ... until now! I'm so lucky to be able to visit so many gardens, but I don't often rave about them .... I love walking around them, I recommend them and I take photographs so that my readers can visit if they wish .... but yesterday I visited a fantastic garden .... and I'm going to give it a 5* write-up .. because it deserves high praise - Charts Edge, near Westerham in Kent. I've driven past Charts Edge many times, but never been there on the right day to visit, because opening times are restricted (Fridays and Sundays during the season from 14.00-17.00), but this time I was lucky and just happened to be in the right place at the right time! And thank heavens, because I found my own piece of heaven the moment I arrived, when I set eyes on the glorious Rainbow Border (above) - a brilliant piece of planting, reflecting the colours of the rainbow, alongside a magnificent rill. And then there's the sculpture, like the piece above - wonderful pieces all over the garden, but this was the one that caught my eye - such a simple idea, but beautifully executed. If it had been for sale, I would have bought it, even if my husband had murdered me on my return home. This is just one of many that I would happily have taken home, but none are for sale ... they've all been chosen by the owners to enhance the beauty of this extraordinary garden. Charts Edge extends to nearly 10 acres and is very much under development, but the owners clearly have a great eye for what looks good in this environment. 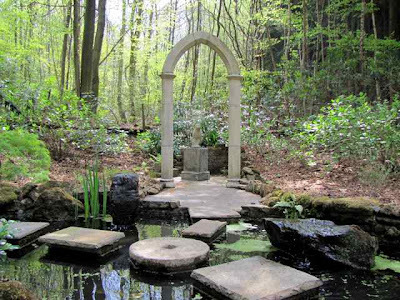 Much of the property is woodland, and there are fantastic trees throughout, but each corner you turn brings a new vista into view, like the pond and statue above in the heart of the woods. Water is very much a feature here and there are several different aqua features in the garden, with fountains, ponds and a bog garden. Another striking feature is the plant labelling ... and I have rarely seen such excellence - every time you see a plant you like, there's a label telling you what it is. 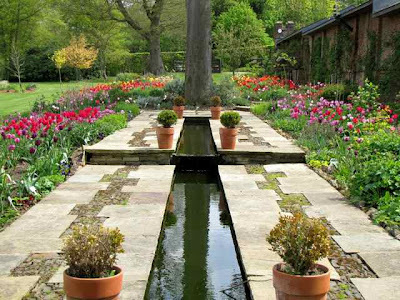 But what makes this garden really special is its tranquility, it's exceptional planting and the overall feeling of serenity. It looks lovely. Thanks for the virtual visit! Wow! What a fantastic looking place. Absolutely love the stags head sculpture. I shall be adding this one to my list of places to visit! Oh dear, if I design a dream vacation this garden will be on the itinerary. I love that sculpture of the antlered deer rising up and the fact that it is woodland and has many trees. The water pavement and rill are just lovely, and that stag's head is stunning. Lovely post, and a garden I wasn't familiar with, thanks! Another one for the 'one day' list...I was really drawn to the archway at the forest edge! Everything is so beautiful. 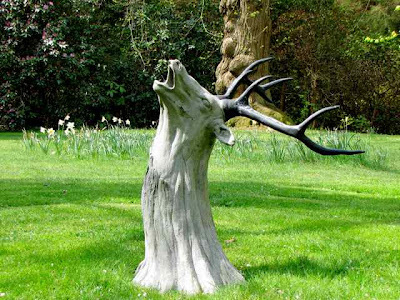 I like the deer sculpture. Gorgeous garden. I'm sure you have more pictures, Charlotte. Will you do a second post? Is the deer (or is it an elk?) made of wood or stone, is what I'd like to know.... The rill is fabulous, very underdone here (I should say not done at all, never seen one) in the 49th state. What an incredible place, thank you for taking us on tour with you. The sculpture is truly amazing, and the last pond is so inviting. Were you allowed to step from stone to stone?